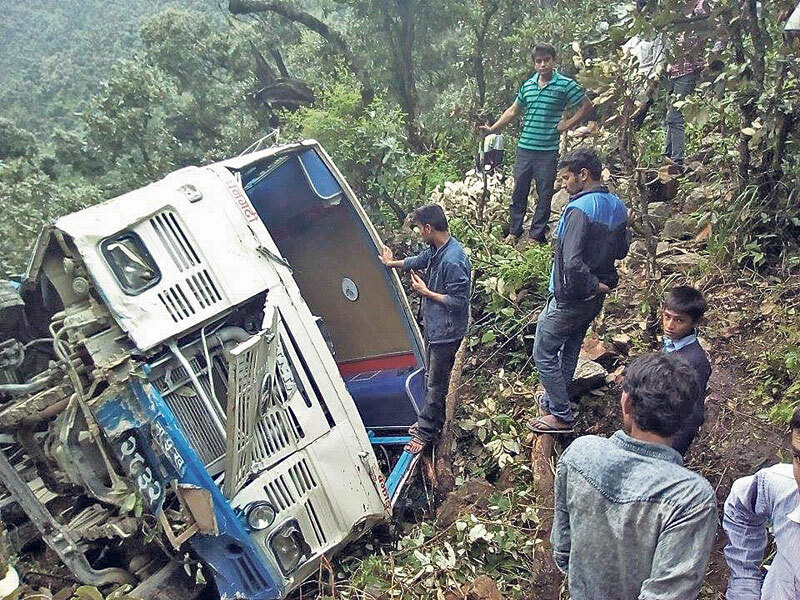 The bus accident in Baitadi two weeks ago in which three people had died. KATHMANDU, Aug 30: While big road accidents have been occurring almost on a regular basis, the government hasn't resorted to highway patrolling, which could have averted many of the accidents and saved hundreds of lives. 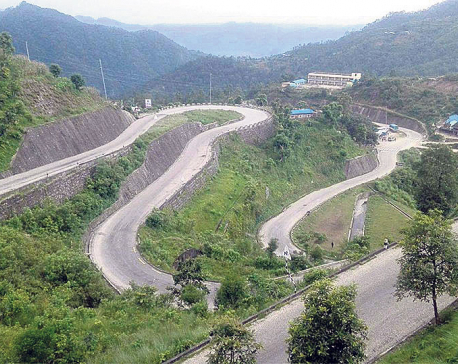 Police officials said there is no practice of highway patrolling in Nepal even as the condition of the highways and other roads remains precarious, the road vehicles are old and reckless driving is rampant. "We have a total road network of over 80,000 km but only about 2,200 traffic police are deployed, half of them in Kathmandu Valley," said Joint Secretary Yadav Prasad Koirala, spokesperson of the Ministry of Home Affairs. Koirala added that a lack of adequate precautionary measures has also contributed to the spurt in road fatalities. Patrolling the highways picks up during the festive seasons, at election time and when major political happenings are underway. But at other times the highways are more or less abandoned by the security agencies, except for a few checkpoints at the key road stops. According to Nepal Police, it is almost impossible to deploy security on the highways due to lack of manpower and logistics. With the growth in the road network, including strategic roads, local roads and rural roads, the need for security deployment on the vitals arteries has also grown, but the government is unable to meet this need, DIG Madhav Prasad Joshi, Nepal Police spokesperson, said. Nepal Police has separate highway patrol units under all its regional offices, but these units exist in name only. A unit of one police vehicle and four to five personnel can hardly cover hundreds of kilometers of road spread across several districts, according to DIG Pankaj Shrestha, who heads the Traffic Police Division. With a view to enable drivers of long routes to refresh themselves along the way, the authorities had set up refresh centers at about 33 places across the country. But those centers have gone used as there was no one around to see to it that the drivers took advantage of this facility. "It was very effective in the initial days as the law enforcement agencies regularly monitored the drivers and the condition of their vehicles, but the agencies concerned have discouraged the idea," DIG Shrestha informed. Time-cards for long-haul passenger buses were brought into use on most of the highways to deter speeding and maintain gaps between vehicles. But in lack of a proper regulatory mechanism, many drivers were found flouting the concept, police officials said. Lack of double drivers on long routes, overloading and lax traffic management during crises or emergencies have also been contributing to the high number of accidents. Had there been better highway patrolling, road fatalities would be minimized, the authorities said. They also blame poor road conditions and lethargic maintenance by the Department of Roads. 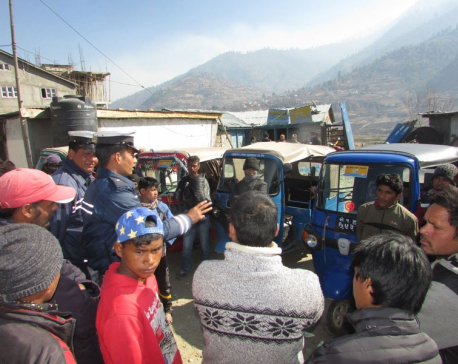 "Highway patrolling is not the only solution but regulations that remain in force long-term, educating people about road safety and ending of transport syndicates might also help lower the fatalities," DIG Prakash Aryal of Metropolitan Police Traffic Division said. Some high-level officials from the Ministry of Home Affairs suggested that personnel from the Nepal Army, Armed Police Force and Nepal Police should be deployed on highway security and patrolling to check the growing rate of road accidents.